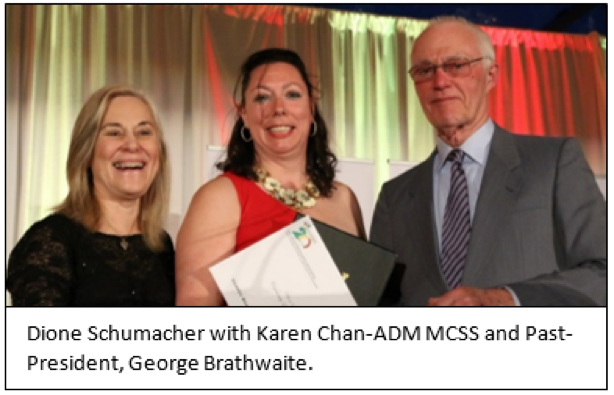 The winner of this year’s George Braithwaite Scholarship Award is Dione Schumacher of Community Living South Muskoka. Dione has been a dedicated and hardworking staff member and manager at Community Living South Muskoka for 24 years. Dione has led the DSW apprenticeship program, sits as Co-Chair to the Georgian College Advisory Committee for their DSW program, the lead of the Safe Management Group Trainer, Chair of the Regional Family Home Network, a member of the Poverty Reduction of Muskoka Planning Team, and participated in of the Provincial Working Groups who reviewed the recommendations from the Guy Mitchell inquest.